Last weekend was pretty much my "dream weekend" of photography! 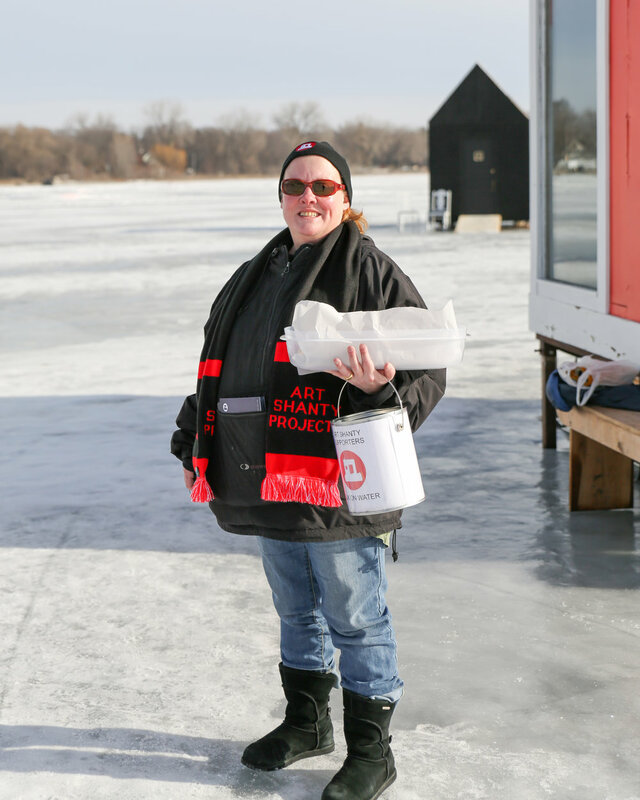 I was hired for three different jobs: The Great Northern Festival (see prior blog), the Art Shanty Projects AND the Minneapolis Kite Festival. The Kite Festival has been around for years... 17 years to be exact! 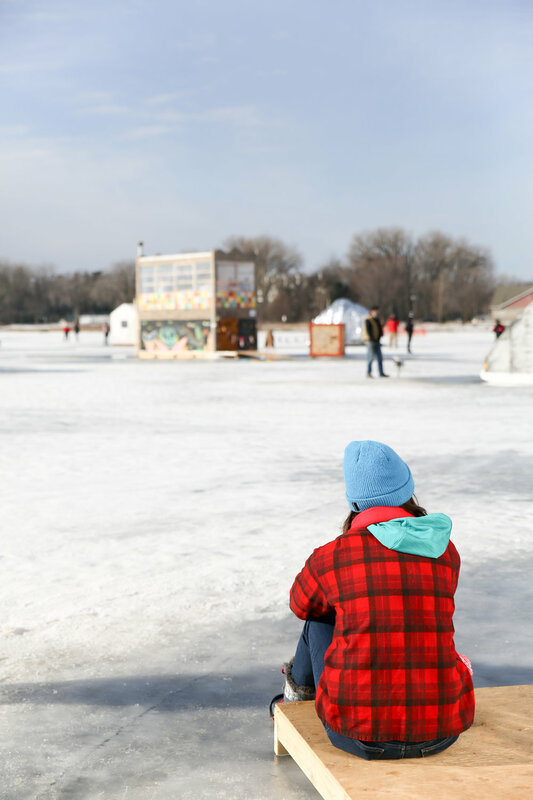 It takes place on the frozen Lake Harriet just outside the bandshell. 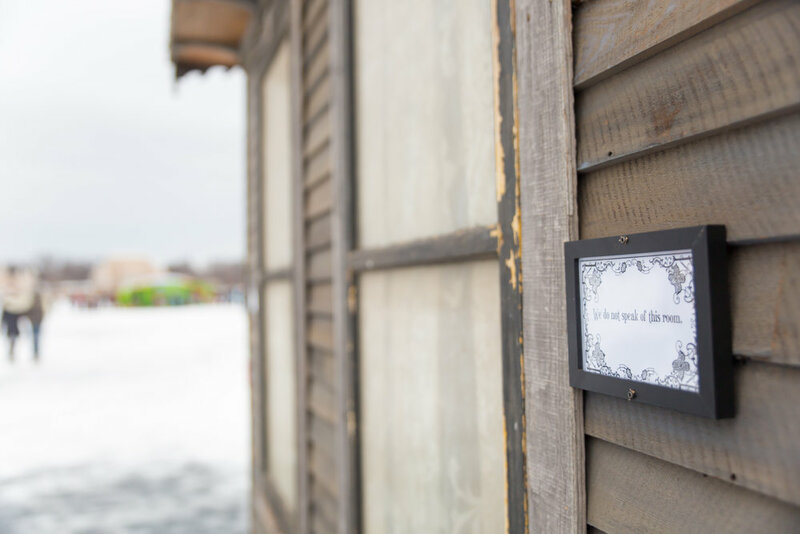 This year it was the neighbor of the Art Shanty Projects. Some people travel from all around the country to see the kites. One of the largest kites at the festival costs over $30,000! Amazing! In addition to a colorful array of kites in the air, there is a full-on celebration! 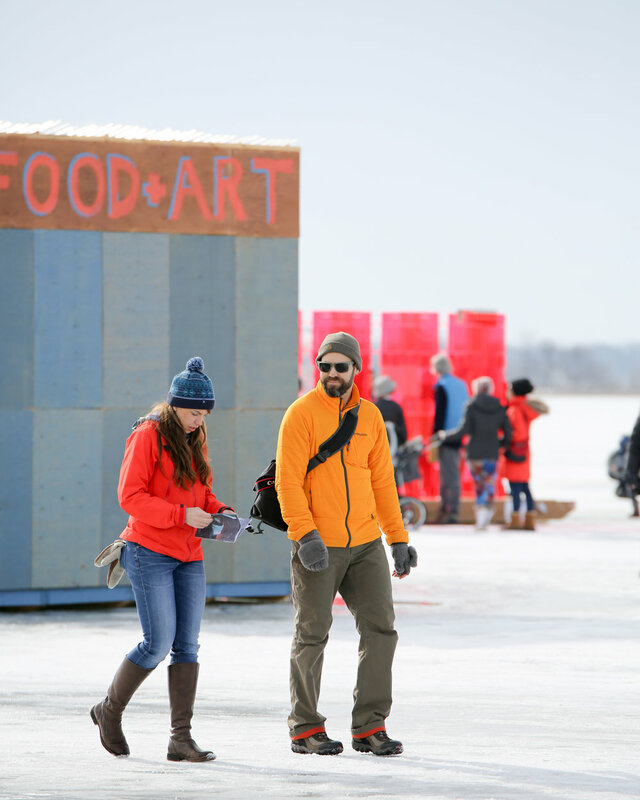 There were fires where you could roast marshmallows, music, horse drawn carriage rides, free tea and granola bars, food trucks, story time and crafts, and the opportunity to try out fat tire bikes and ice fishing! It was a big colorful celebration of the people of Minnesota and our love of community and the outdoors! 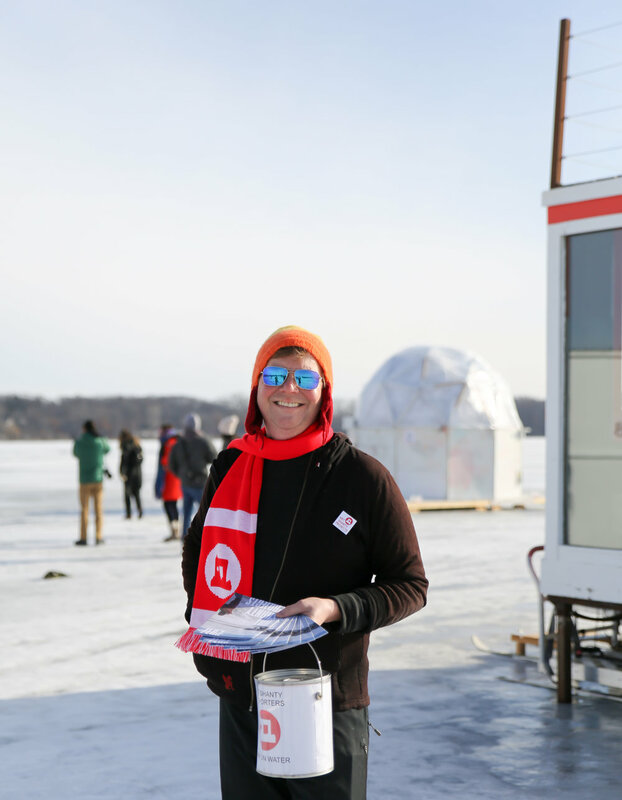 It was an honor to partner with The Great Northern Festival and Target and spend last Friday exploring some of the Twin Cities' most exciting winter activities! 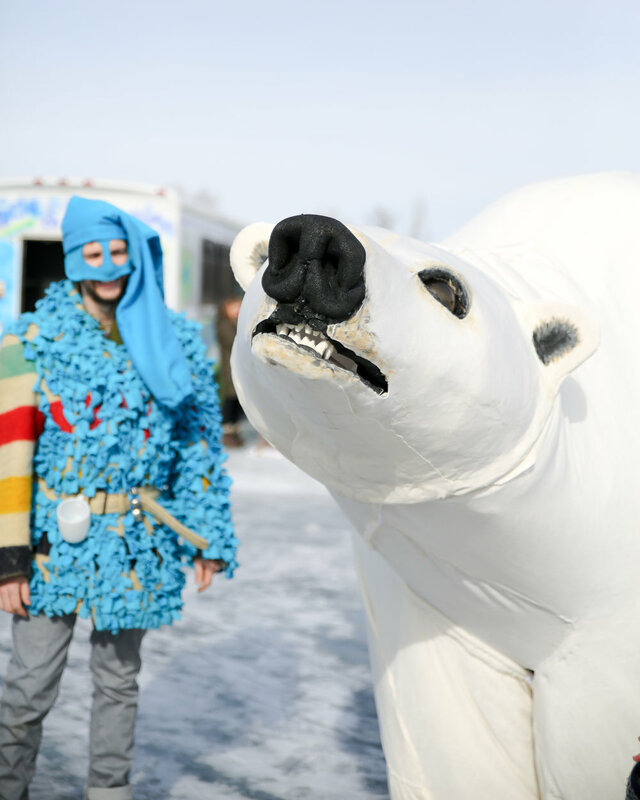 The Great Northern Festival encompasses many of the winter-themed events that occur over a 10 day span in the heart of winter. 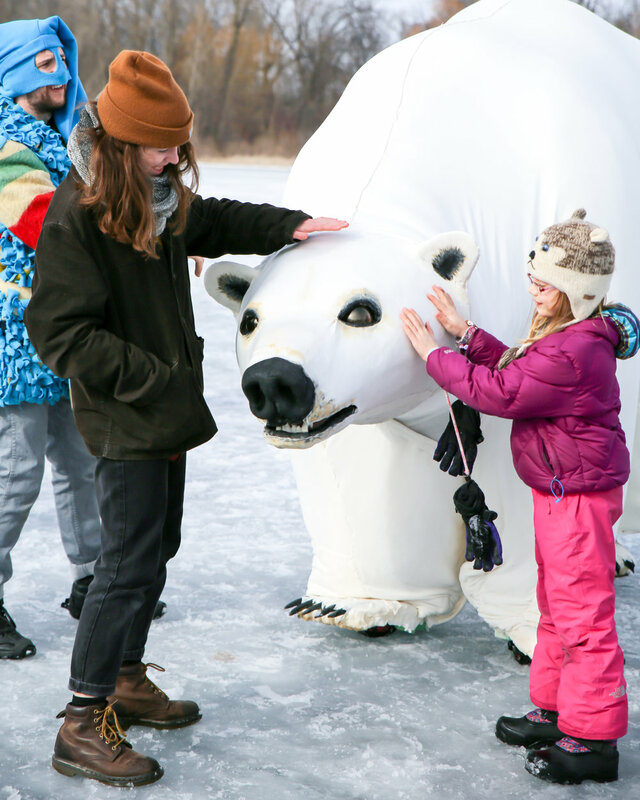 The collaborative celebration across St Paul and Minneapolis is all about embracing winter, getting outside and having fun! It is a way of showcasing how we do winter in the north! 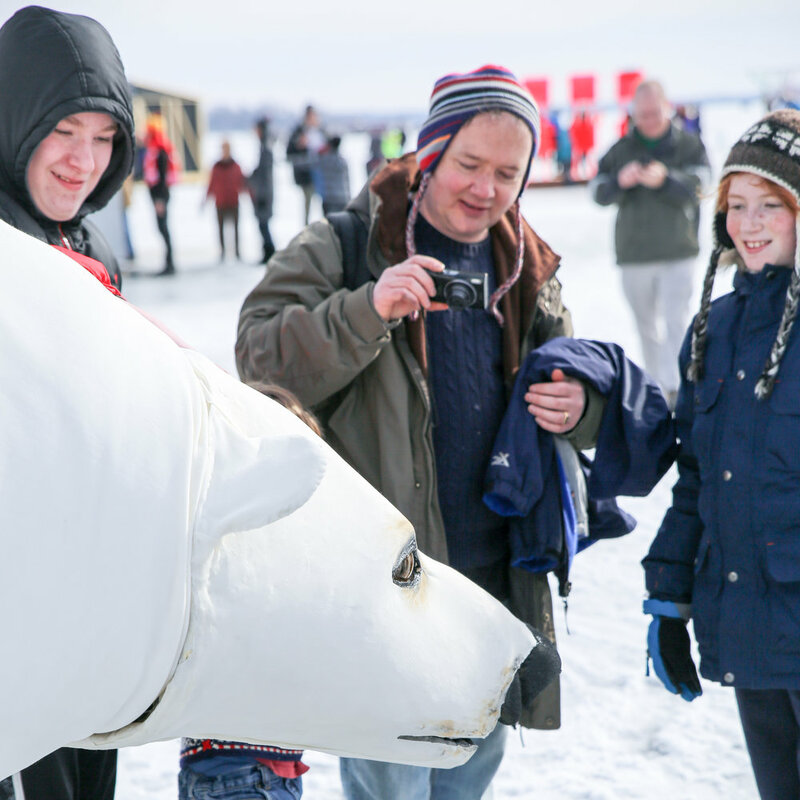 Some of the Great Northern activities include the Loppet, the Winter Carnival in St Paul, the Vulcan Snow Park at the State Fairgrounds, horse drawn trollies, giant snow slides, an outdoor Winter feast and the US Championship Pond Hockey Tournament. 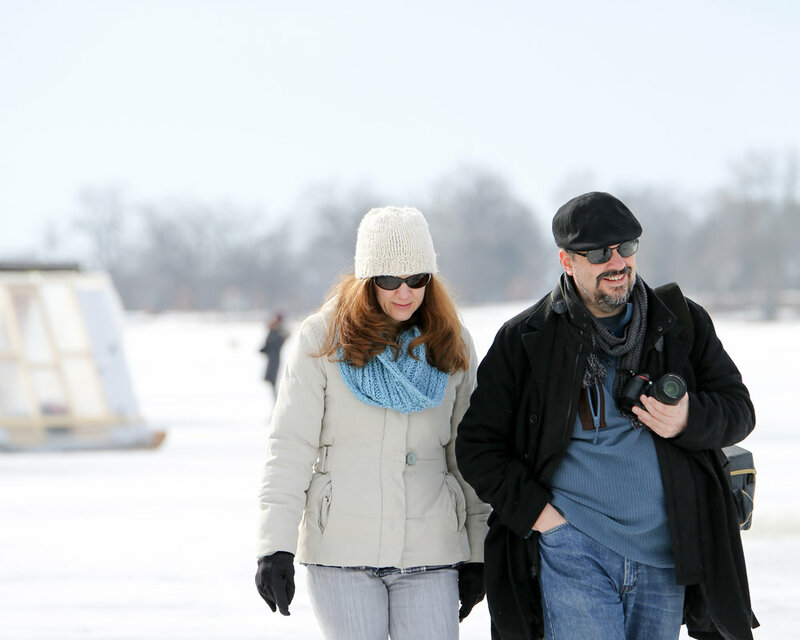 We spent the day at the US Pond Hockey Tournament on Lake Nokomis. 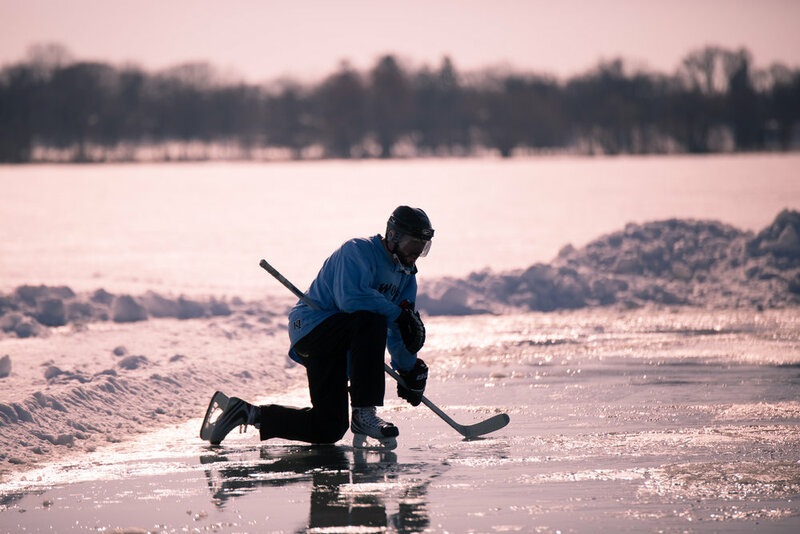 There are 25 ice rinks with hockey games being played - on a frozen lake! It was pretty amazing. We loved being outside on a beautiful sunny day. (All that sun probably was not good for the ice though!) There was a DJ, food, and tons of people having fun. An electric atmosphere. 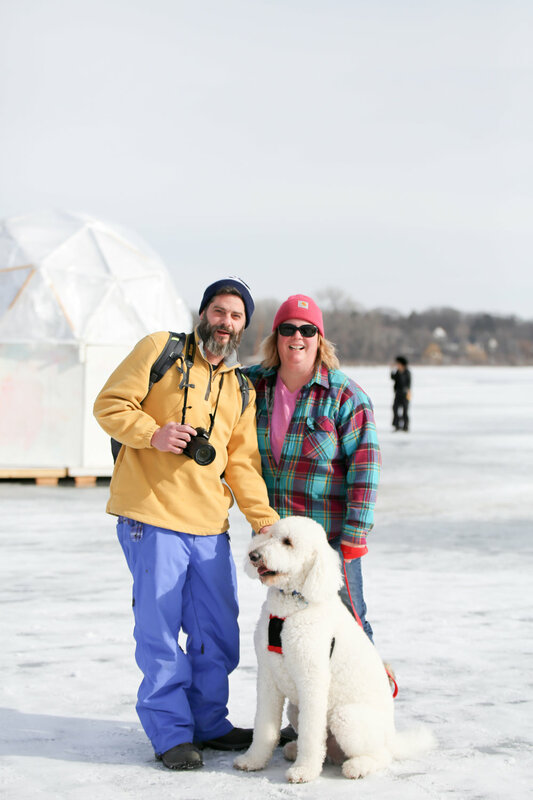 That evening we headed into St Paul and checked out the beautiful Ice Palace at the St Paul Winter Carnival. It was absolutely magical to me. Twinkle lights, music, and ice ice ice! It was a wonderful day. We went to sleep with rosy cheeks and bellies filled with hot cocoa. Thanks for the fun Great Northern Festival!! Hello! 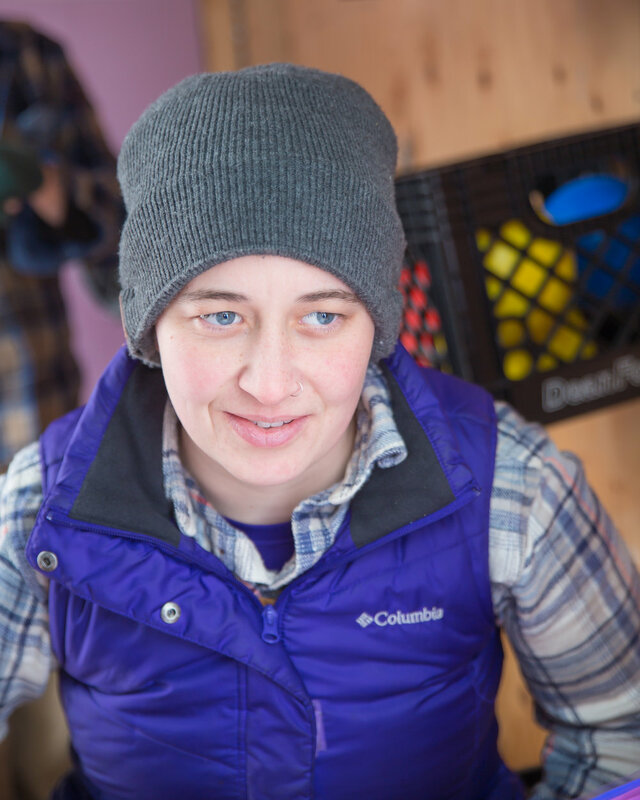 I just love working as the Art Shanty Projects photographer! Fresh air, high energy and lots of creative ideas. Community on ice! It is such a great activity for families too. In my previous post I wrote down a few logistics in case you'd like to go. You can read about festival dates, hours, food, bathrooms and policies by clicking here. 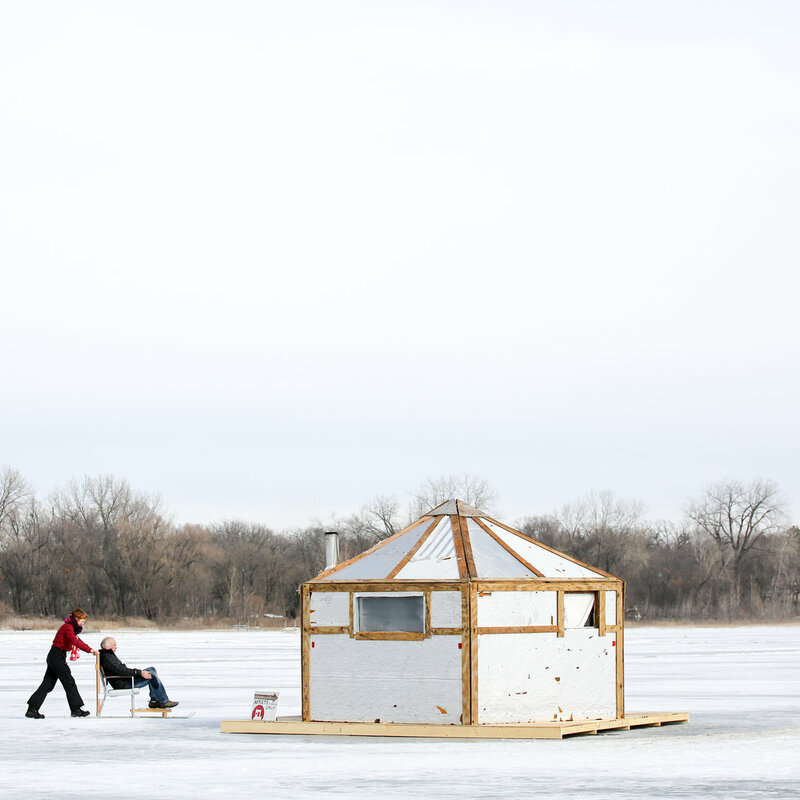 10,000 Lakes Twister Shanty: This eye-appealing shanty pays homage to the Land of 10,000 Lakes. 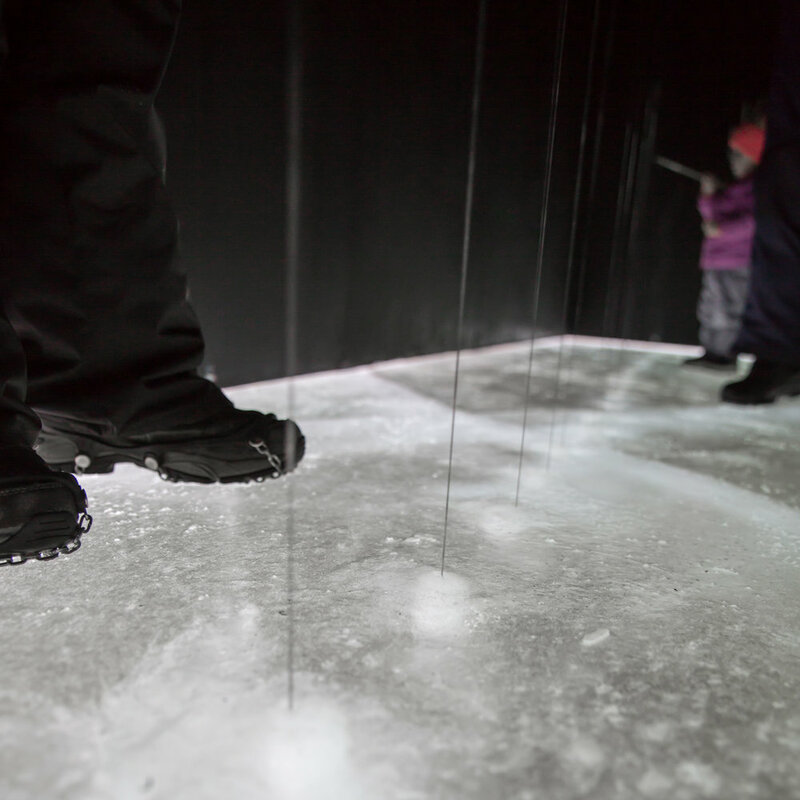 Play Twister on ice and learn about our lakes! Atlachinolli: The Fire & Water Shanty is a "Sculptural Performance" shanty that is a visually stunning tribute to an indigenous concept that hails from central Mexico. The Archive Shanty: Some of the beloved Art Shanty artists from previous years are back and this year they're making you smile in the Archive Shanty. This Shanty will make you scratch your head in wonder at the "specimens" and laugh at the same time. Very clever! BINGO! Shanty: Last year's Chef Shanty has a new roof and a new theme! A giant ball wheel has been installed and guests are invited to play a rousing game of Bingo! 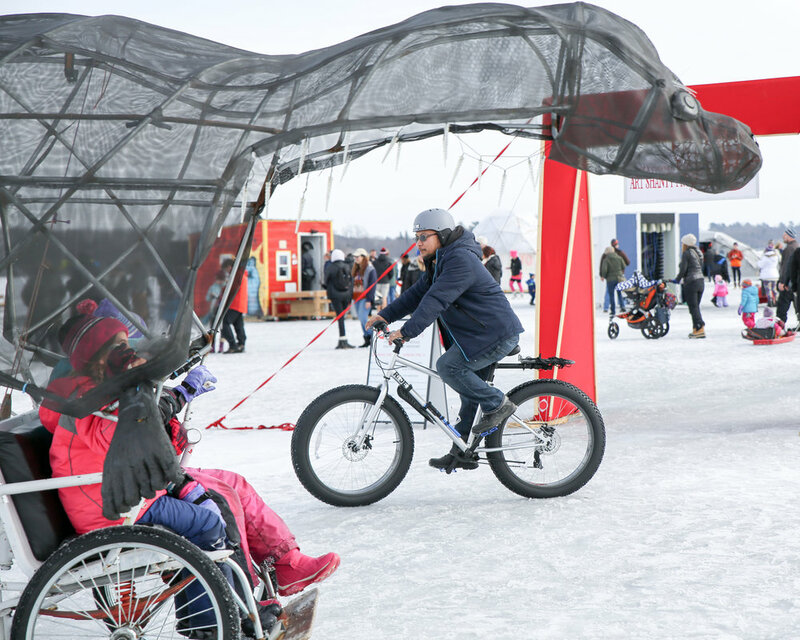 This is probably the only place in the entire world where you can play BINGO on a frozen lake! Cinema Shanty and Ice box Studios: Watch a Zoetrope in action and then slide over next door to create one on your own! The Department of Everything Else: Exactly as named. A home base for many of the performance artists and small groups. Fyr Minnesota Shanty: An off-kilter plaid lighthouse with a rainbow stairwell and bird-themed interactions on the second floor. This shanty was created by teens from Leonardo's Basement! Get In Feel With Your Touchings: Didn't everyone love this game as a kid? Put your hand in if you dare! You may find out that you are the one being probed! The Lonely Whale Shanty: A fascinating shanty and story. Inspired by the true story that scientists have been recording a lonely whale's calls in the Pacific Ocean for over 20 years now. Enter the belly of the whale and learn more. Monarch Butterfly Migration Shanty: This colorful shanty provides eye candy and warmth in the grey of winter. 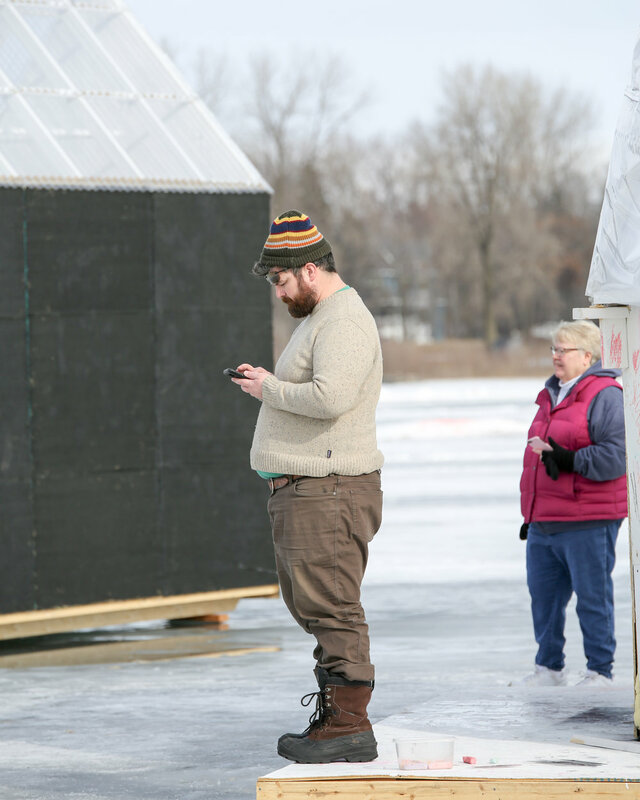 It is so fun to learn about the path of the Monarch while on a frozen lake. 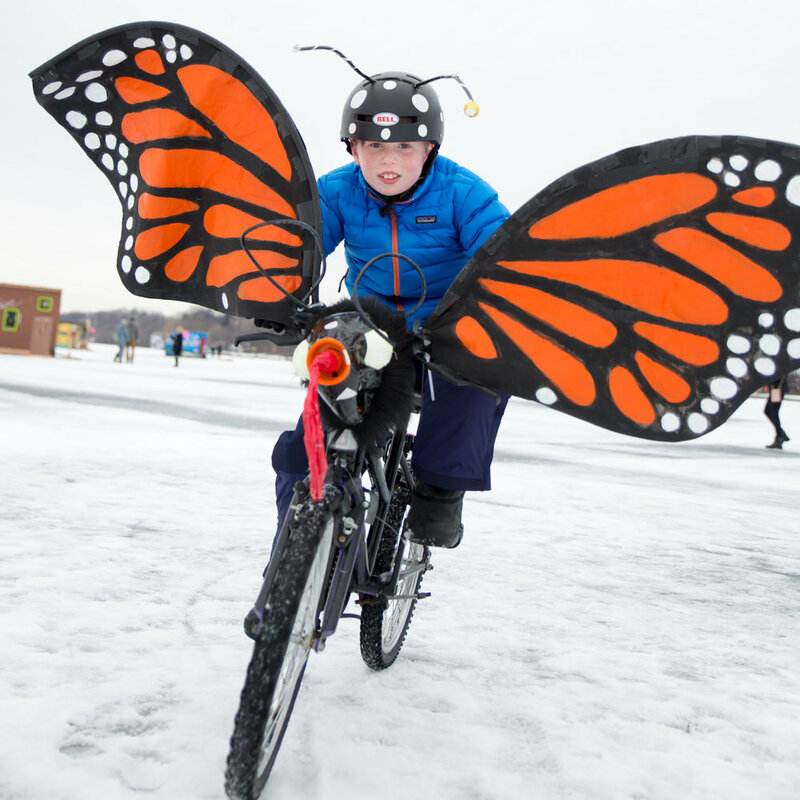 Take one of their butterfly bikes out for a spin! 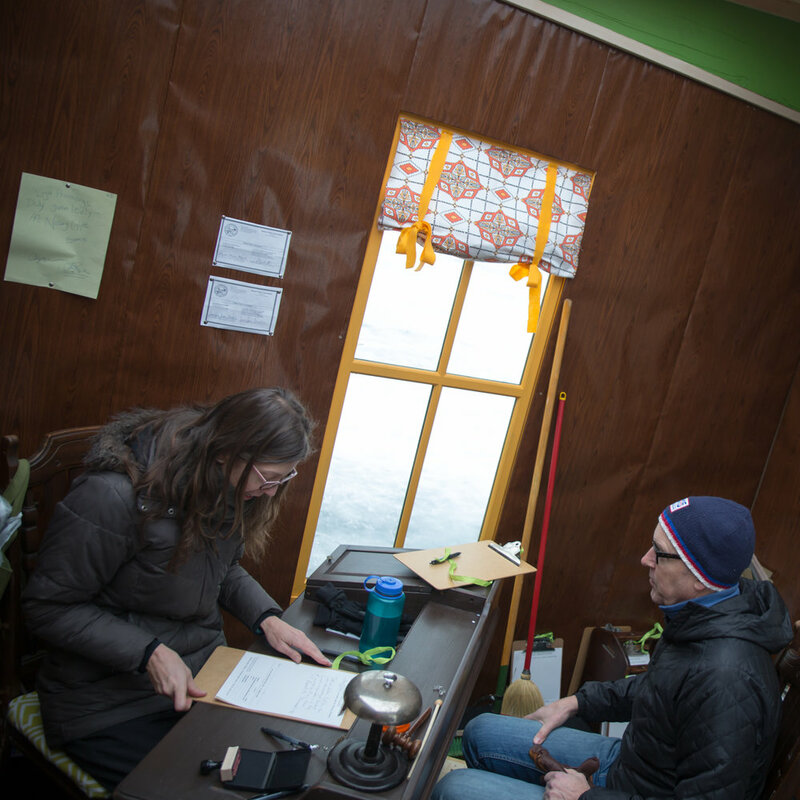 The Notary Shanty (or, The Cold Hard Truth Shanty) My son learned a lot in this fun faux wood-paneled office on ice. He had never heard of a notary! He even made a declaration and had it notarized. The people working the shanty are actual notaries! Word is a couple got married there on Sunday. For real! Phone Valet This little shanty encourages you to leave behind modern connectivity and enjoy some shanty time in analog form. 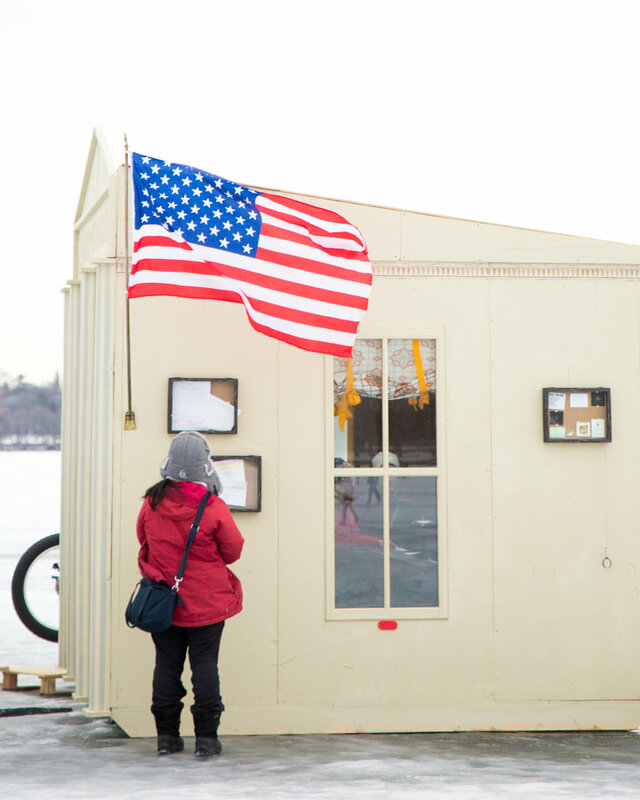 Revolution Shanty: This shanty was created by artists and students at Southwest High School. 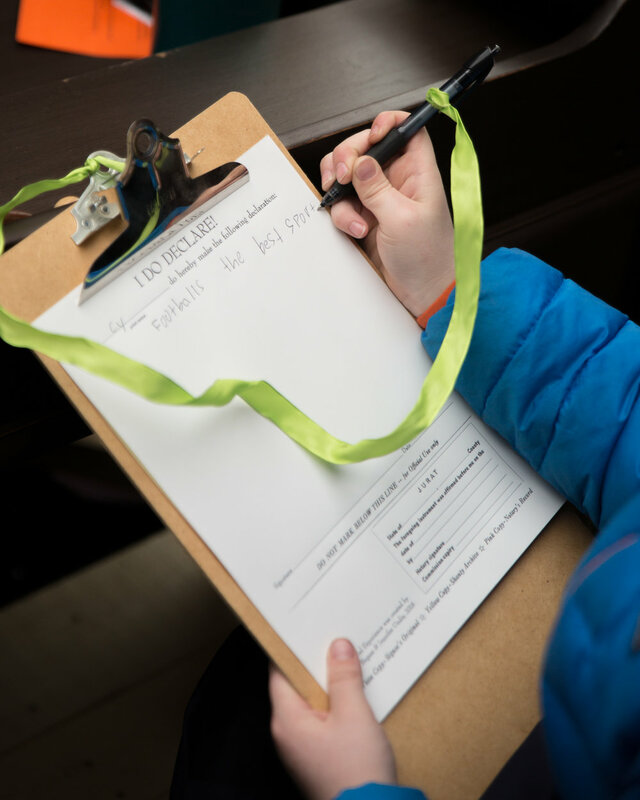 It looks at Minnesota's history of revolution and invites you to write your own revolution poetry. Sonic Shanty: Another great shanty created by returning ASP artists. 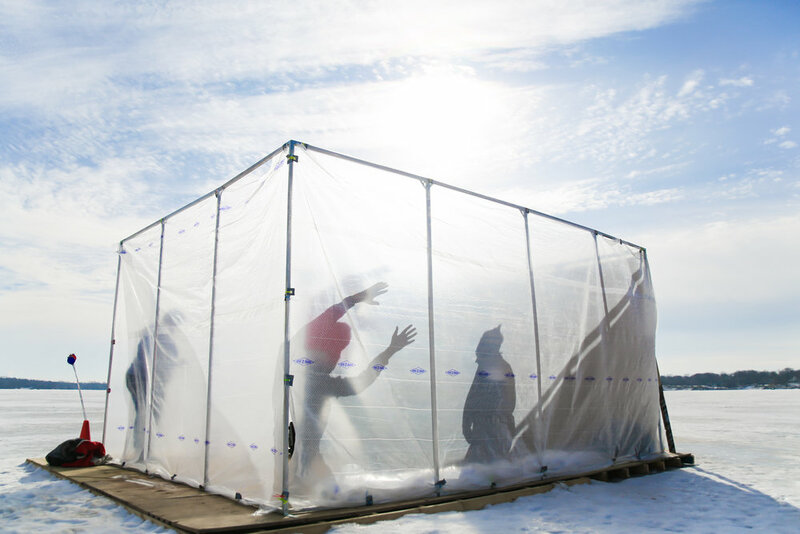 This shanty invites you to interact with the sounds of a frozen lake. An added bonus is the experience of light reflected from ice. Beautiful in sight and sound. Team Engine at Cooperation Station: The game shanty. This was my son's favorite shanty. We stayed there for nearly an hour! We played a puzzle that truly had us "puzzled." My son and I left without solving this difficult puzzle that involved all 4 of our wrists in rope. We asked them not to tell us the solution so we could try again next weekend! A fun for all ages shanty! The Theatre of the Tiny Clandestines: We heard loud laughter coming from the inside of this ornate shanty. I can't wait to return and witness one of their 5-10 minute storytelling skits. The Thwing: Group swing on the Thwing! 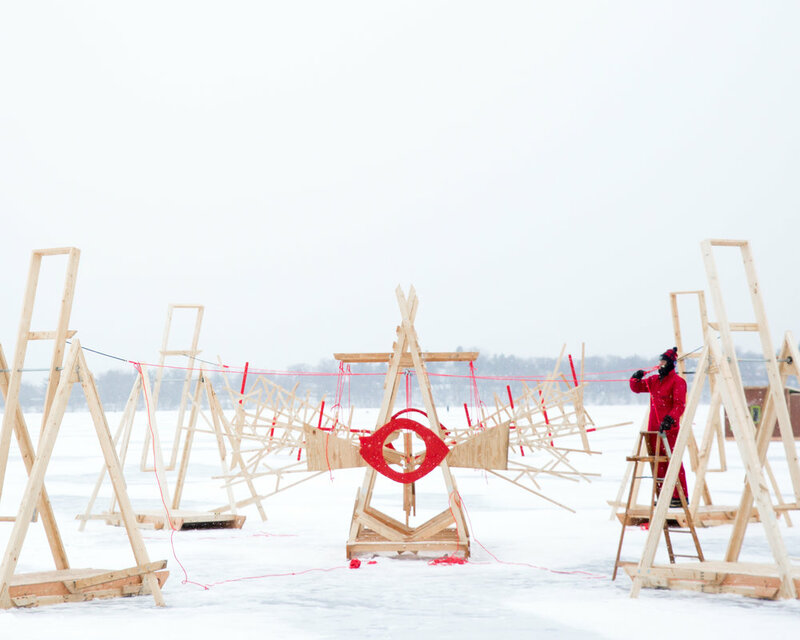 To witness 4 people simultaneously swinging on a frozen lake is sure to make you smile! Give it a try! 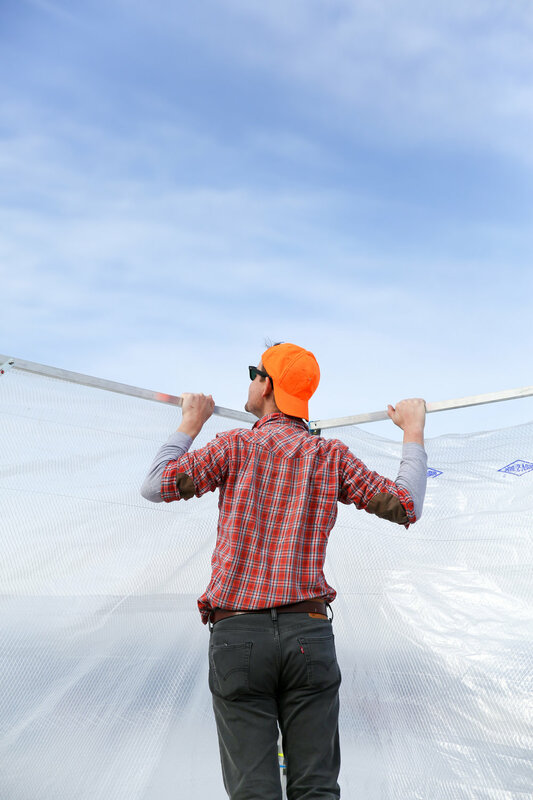 Take the Thwing for a swing! It is fun for all who dare! 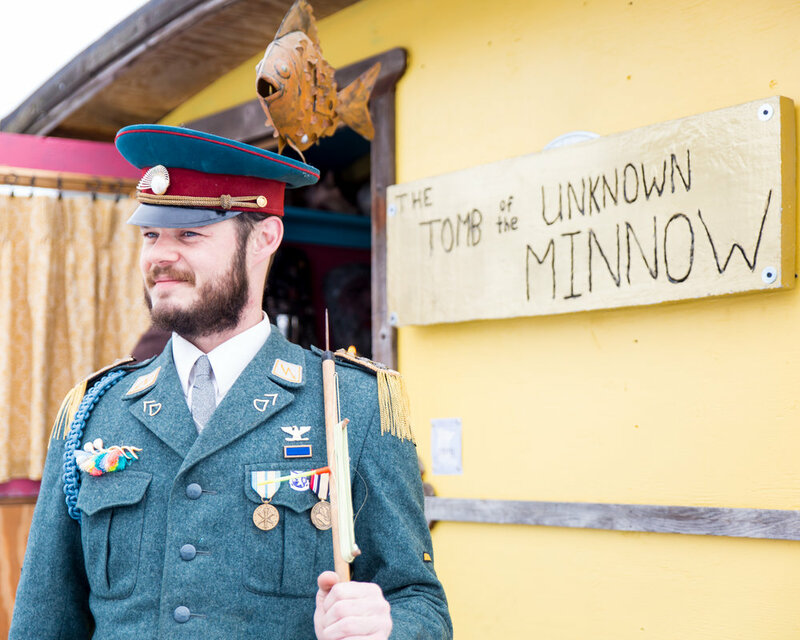 The Tomb of the Unknown Minnow: Enter the Tomb of the Unknown Minnow. 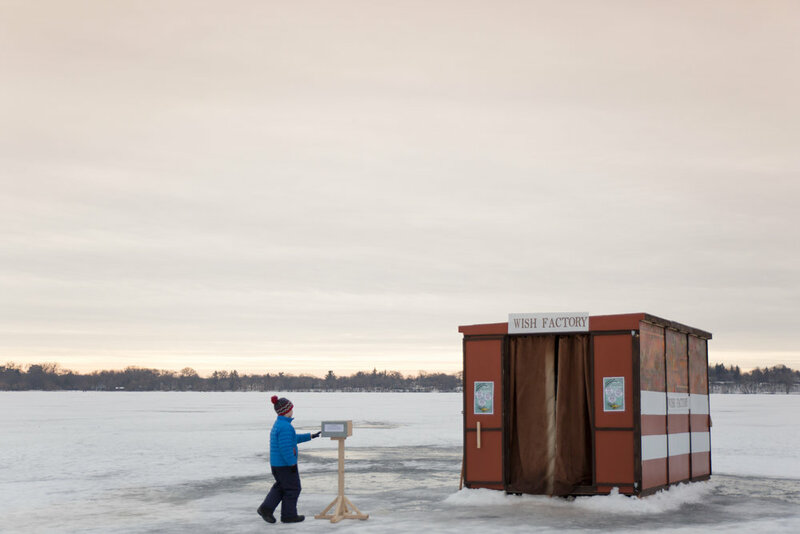 Pay your respect to one of Minnesota's most popular fishing baits and thank him/her for their service. Twin Cities Sailing Club's (or TCSC) Sea Shanty: This shanty rocks. Literally. Feel the motion of the lake even when it is frozen. The Welcome Shanty: The ASP has a new Welcome Shanty this year! It has indoor and outdoor space. This year it includes a large board that has a map and performance schedule posted. Be sure to grab an official program here. This is also where you can become a member and help support this free festival! Members have access to private evening events and other perks! Why Not Knit! 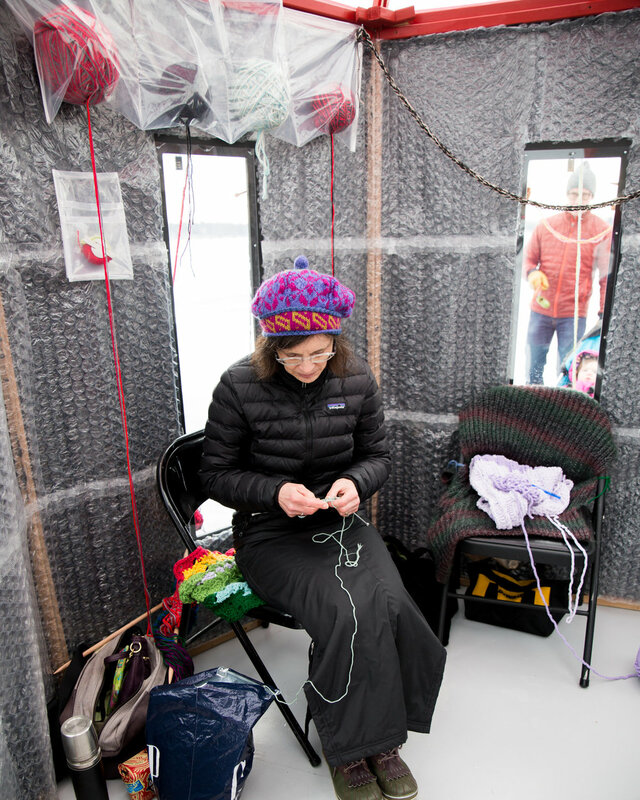 Enter this shanty to meet friendly faces who enjoy teaching others about their craft. This shanty is colorful and cozy and full of interesting stories! Wish Factory: Make a wish, write it down and put it into the Wish Factory Machine where it is transformed into a token! This cozy shanty is decorated with all things wish-centric: genie lamps, birthday candles, the first star, coins in a fountain, wishbones and more. And thats a wrap on my photo tour of the 2018 Art Shanty Projects. 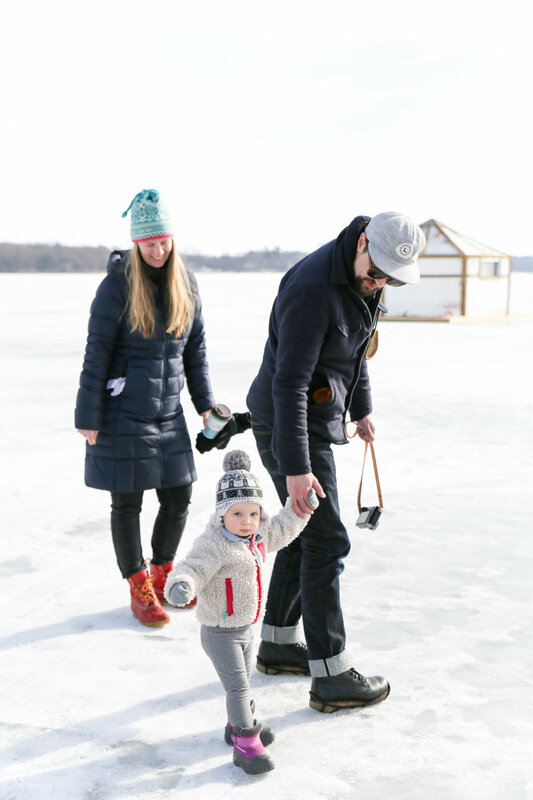 Hope to see you out on the ice this year! 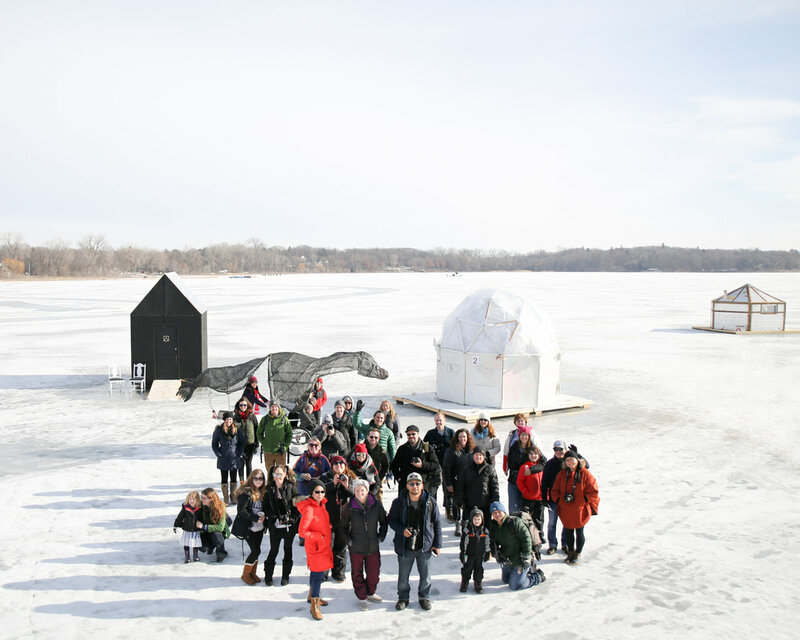 Every year 20 colorful ice shanties pop up in a grouping on a frozen lake somewhere in Minnesota. It used to be White Bear Lake. Before that it was Medicine Lake. 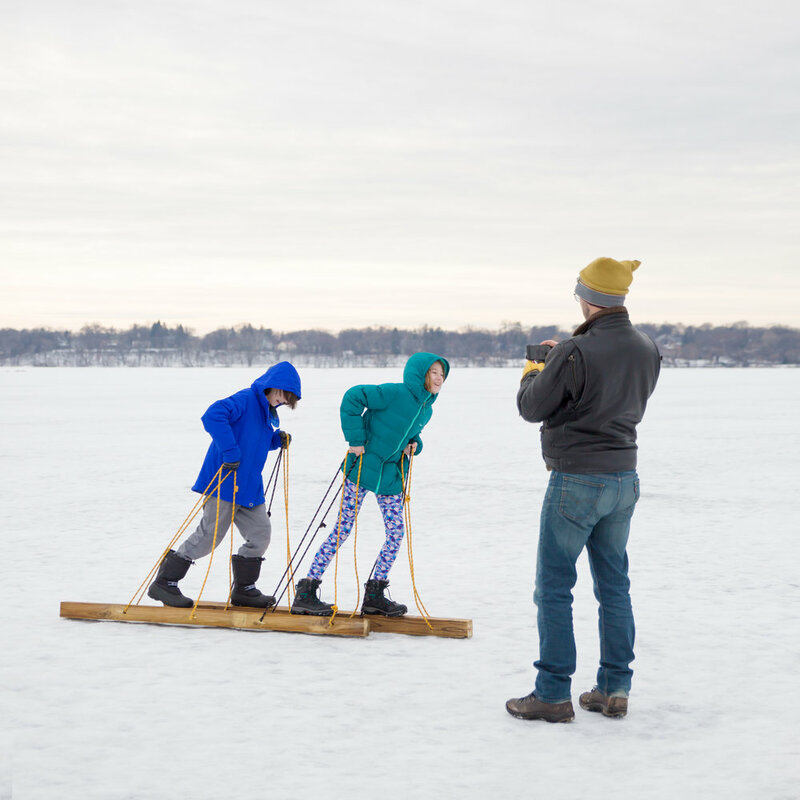 This year -- it is on Lake Harriet!! Located just a bit south of Downtown Minneapolis and right in the heart of the Twin Cities. To me this festival IS the heart of the cities. It is us at our best! Braving the elements and celebrating what makes us unique. I am so happy to have it so close to the cities this year. This village of shanties may have been inspired by the shanties fishermen use.. but the resemblance stops there! 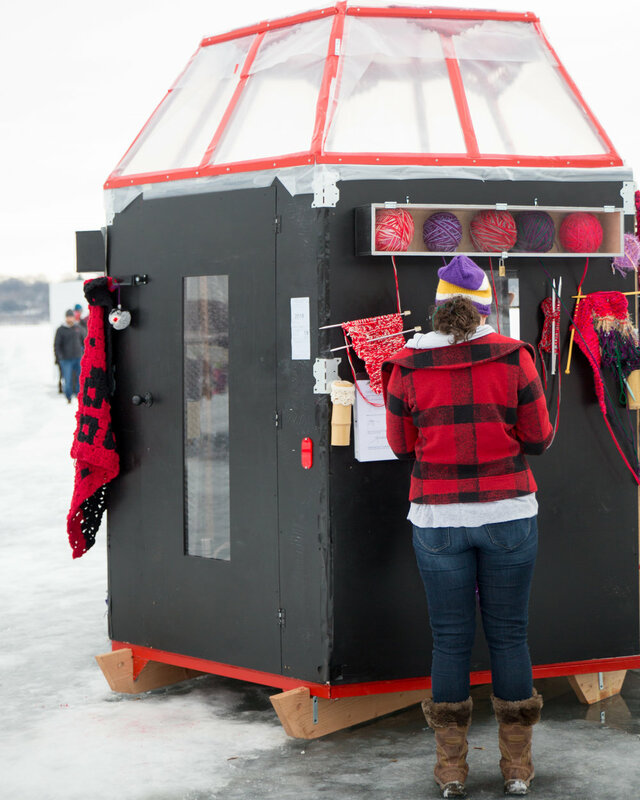 These are interactive shanties are created by artists. 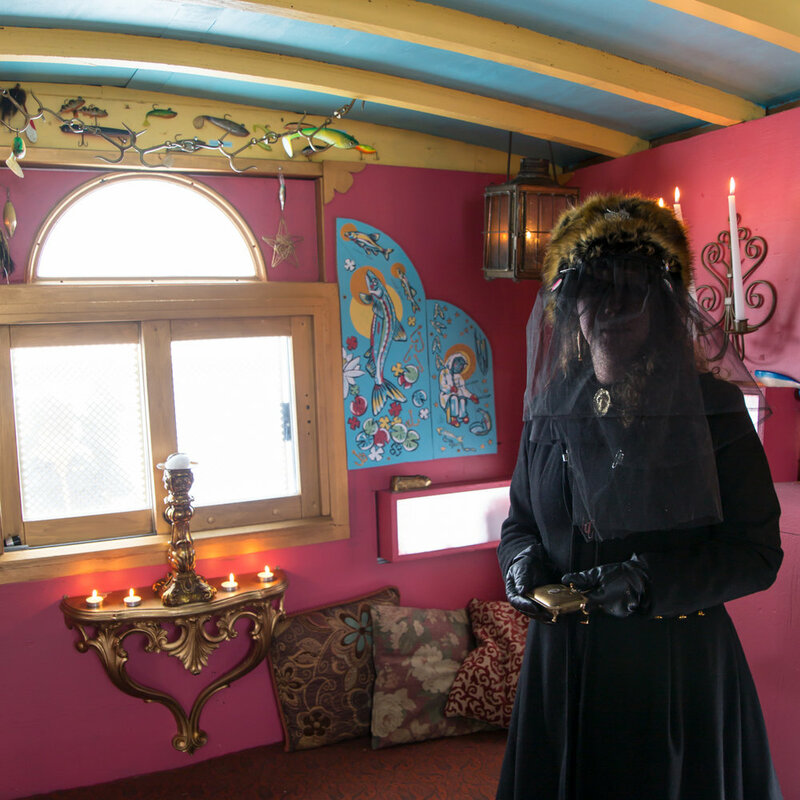 When you enter an art shanty - you enter another world! You are invited to enter each one of these amazing shanties. 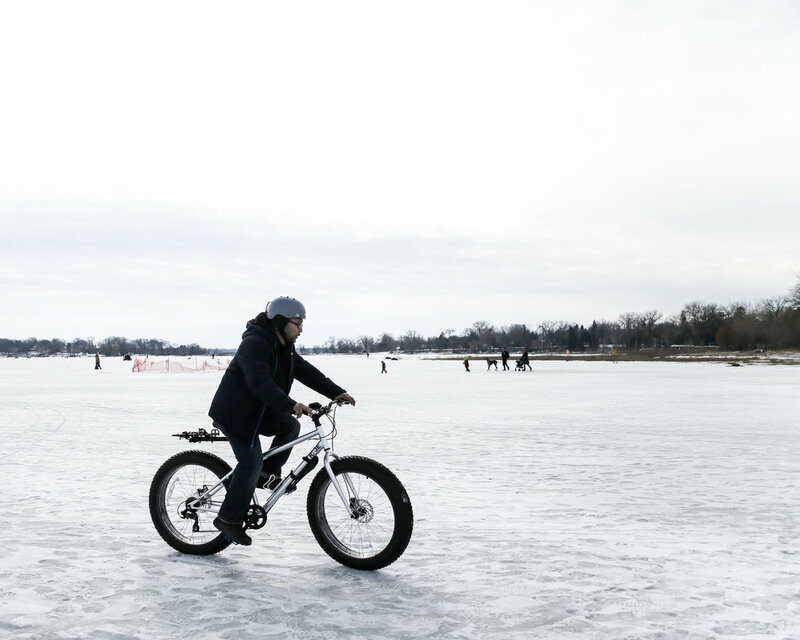 This really is a Minnesota Winter "Must Do." Get out there while you can! 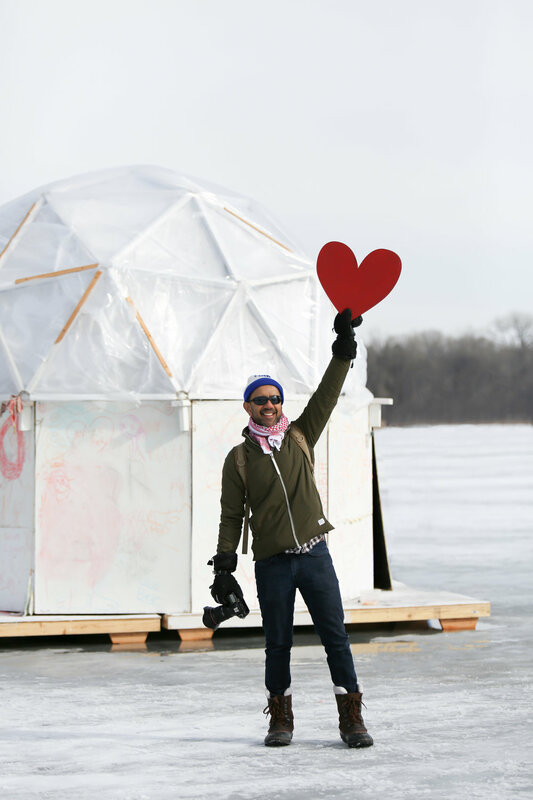 The Art Shanty Projects are located on Lake Harriet in Minneapolis. They're on the ice - about a block or two in front of the Lake Harriet Bandshell. 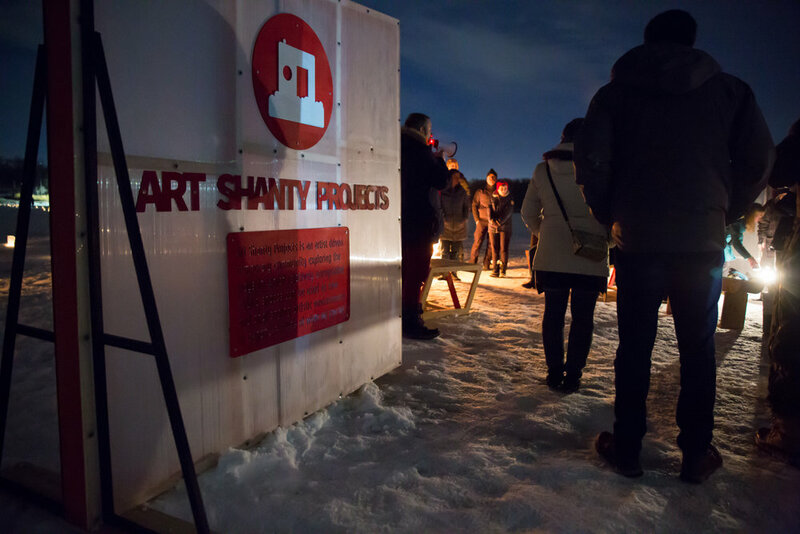 Attending the Art Shanty Projects is FREE and great for families. They would love your support. Become a "member" and be invited to their member-exclusive events including an evening on-ice party! Dogs are welcome to visit - but not enter the shanties. Parking: Is more difficult this year than other years because the festival is in the cities. Space is tighter and attendance is higher. Try heading there early to get a good spot. 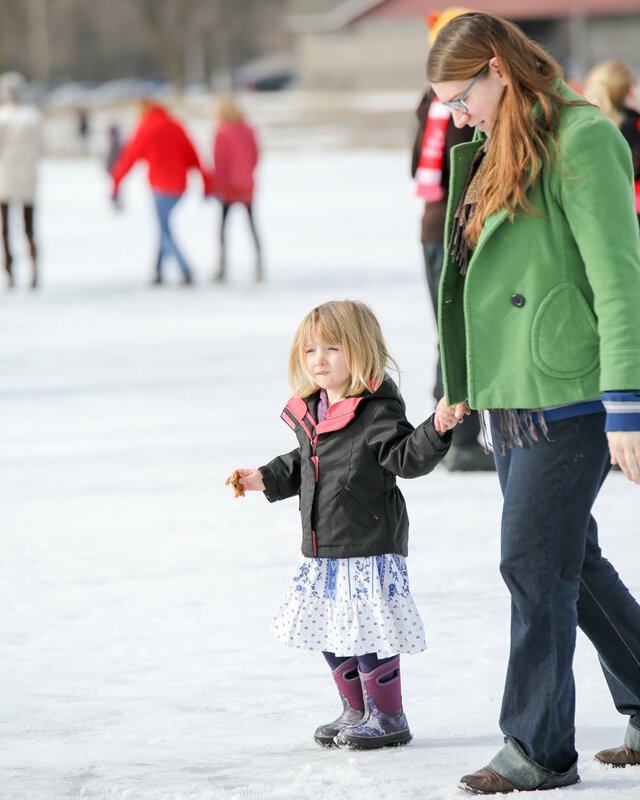 The official parking is in the Lake Harriet Bandshell lot and the surrounding neighborhoods. Don't forget to be creative! 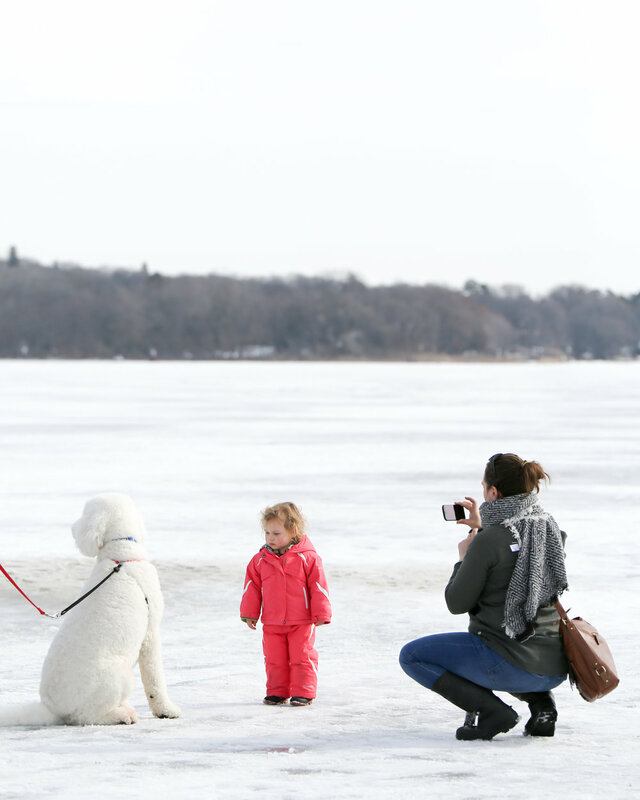 You can easily find a spot on another side of the lake or even near Lake Calhoun & walk or ski right across the frozen lake! If you do this, be sure to dress appropriately. Wind chills are much more prevalent out on an open lake. It can be windy in the middle of the lake even on a calm day. Bathrooms: Go before you come. Haha. I know for most of us that isn't going to suffice. There are about 8-10 Port-A-Potties out in front of the bandshell and that's it for bathrooms! Honestly - once you get over the initial strangeness of "going" outside in below freezing temps, it really isn't that bad. 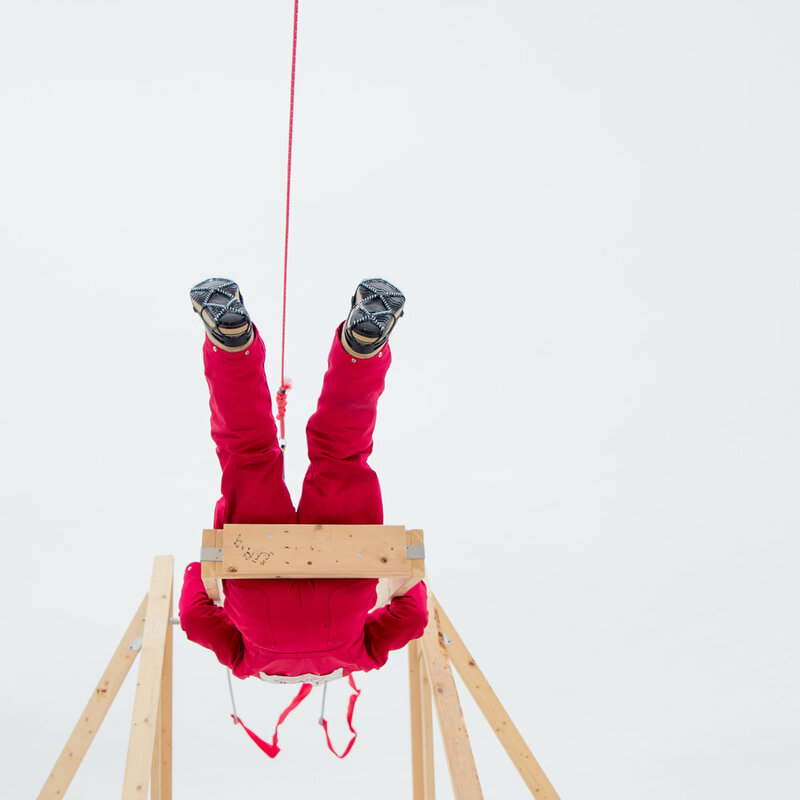 Kid Tips: Parents, prepare like you are going sledding. 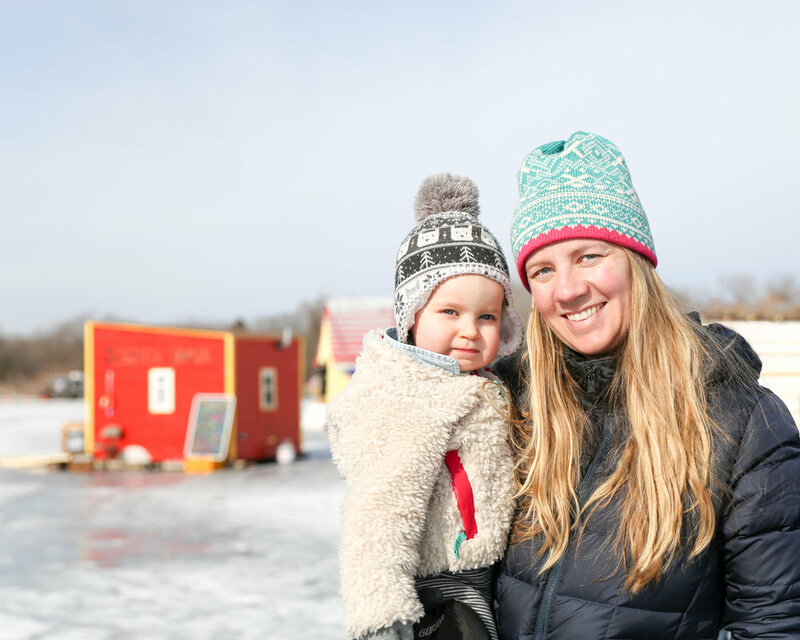 Dress your kids in tons of layers. Consider leaving no skin exposed. (My sensitive-skinned son had windburn from being out there on a cloudy calm 30 degree day!) Bring snacks and water. Hand warmers if you like. There is NO indoor aspect to this festival. 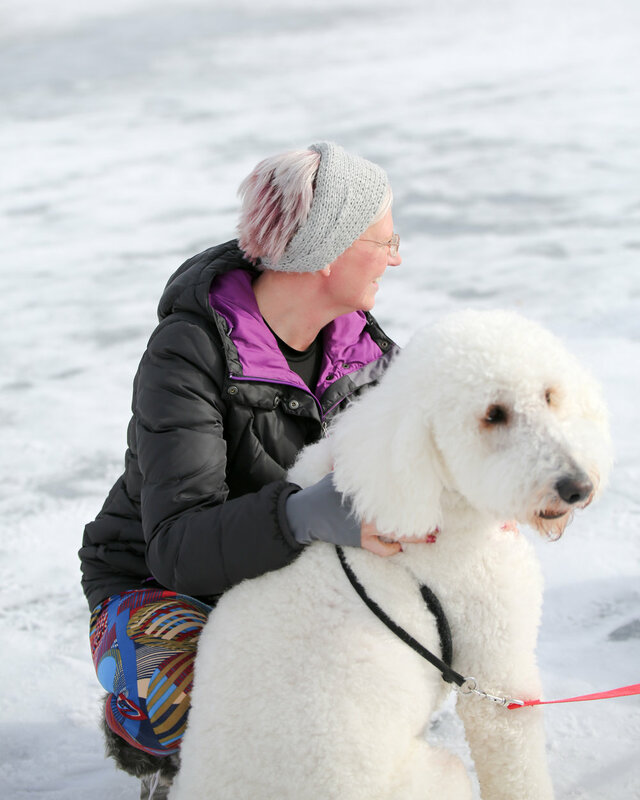 And - you have a gigantic frozen lake as your playground! 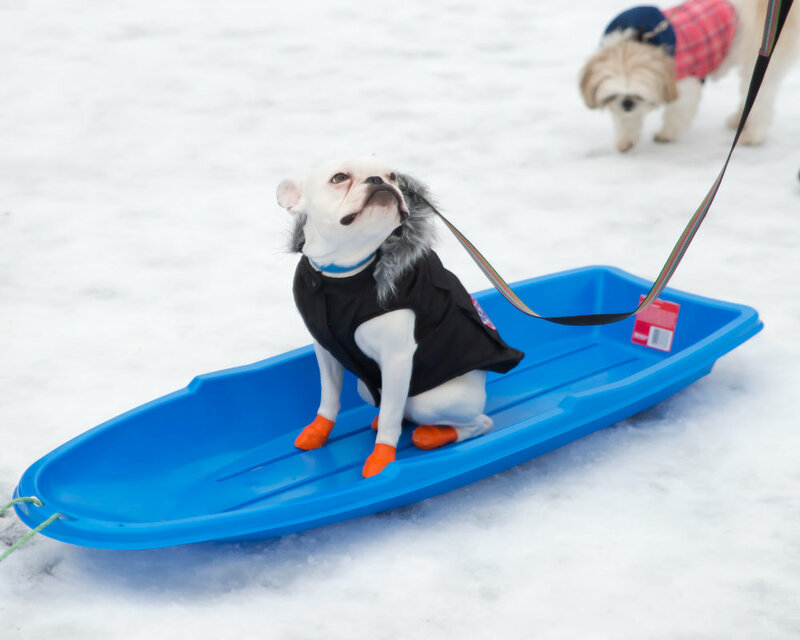 Bring a ball, bring a sled, a kite, ski's, a picnic, make a day of it! I've seen many forms of little-one transportation: sleds, Bob strollers, backpacks and bike trailers. It depends on the snow/ice conditions but most of these items seem to work well. 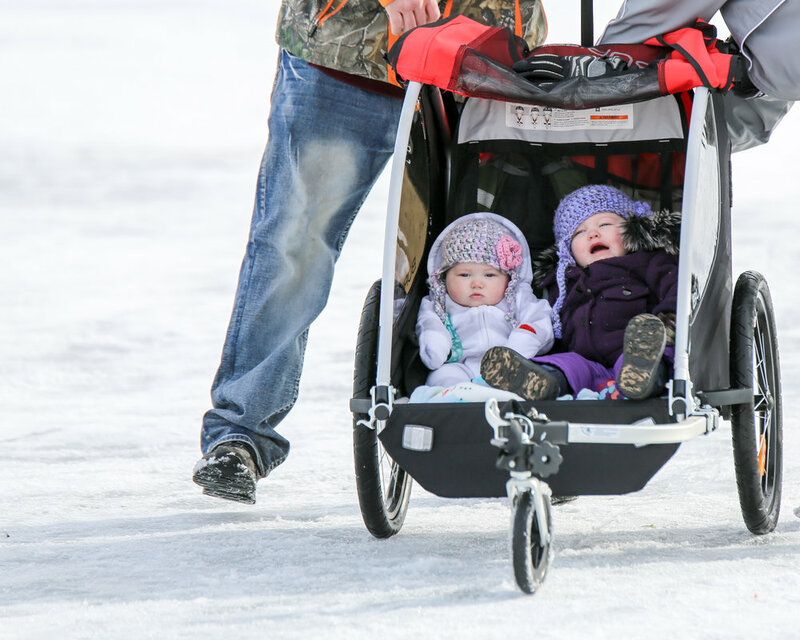 If you're bringing a stroller - grab a few extra blankets. Food: Last weekend there were two food trucks there. Most of the time there will be a food truck or two there. I believe that as this festival plants its roots in the cities - more and more food trucks, bathroom and parking solutions will appear! Wear Boots! This past weekend it was a lovely 30 degrees out and I saw people out there with frozen toes in tennis shoes. 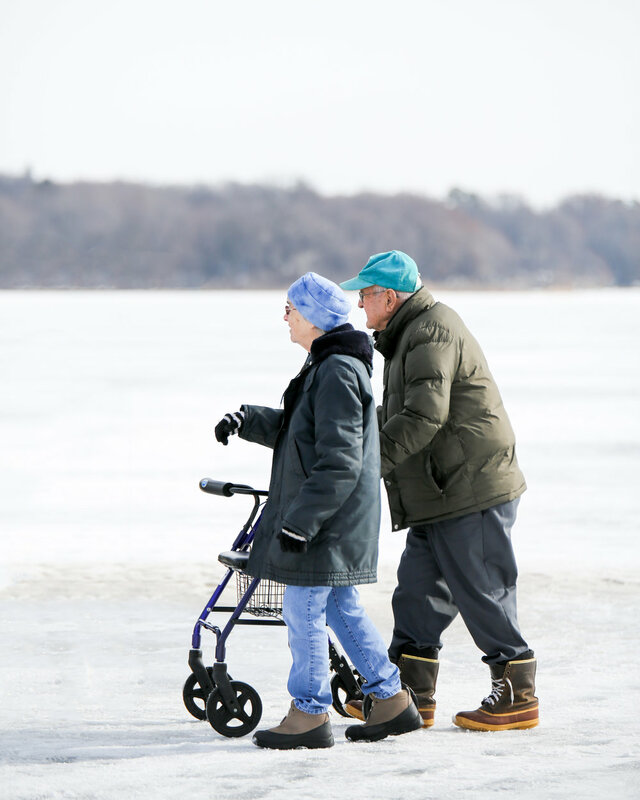 No matter how warm it is remember that you are walking on a frozen lake! Walking on ice is coooold on the feet! See you out on the ice!! When I started this project a little over three months ago, I had hopes of maybe raising $2,000 -- and our amazing community blew that away! This means that about 800 new solar powered headlamps will be given to refugees in the Nakivale Refugee Settlement in Uganda! 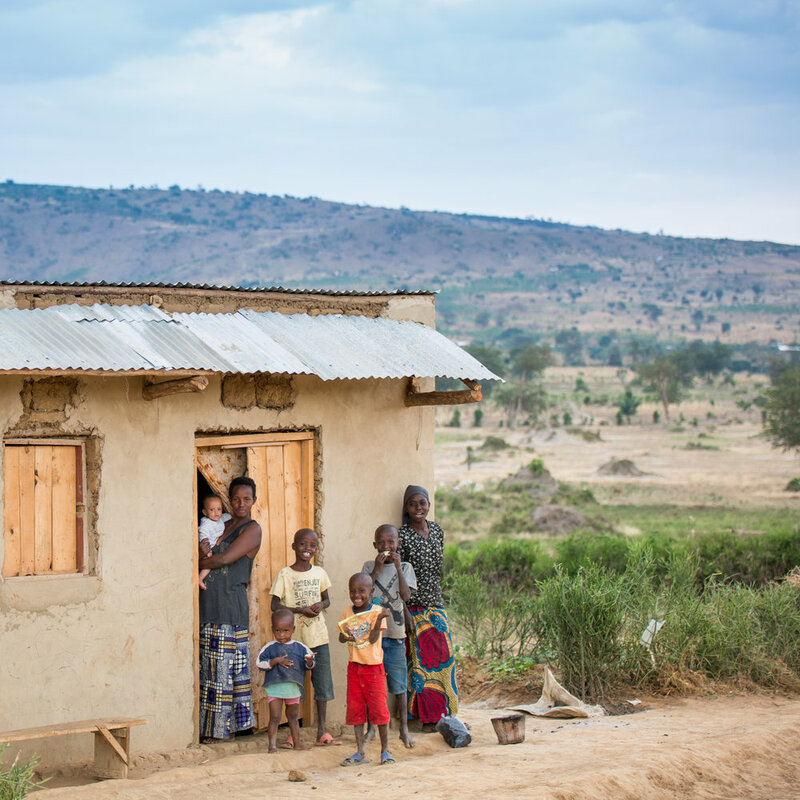 Refugees who are living in darkness without electricty will be able to walk safely at night, use less toxic and dangerous fuels in their homes, use lights to farm, sew and read! These small lights will have a large impact! I may have started this project and been the "mouthpiece" (that's my dad's favorite knick-name for me) but I certainly do not feel like this is "MY" project anymore! It is the product of an amazing community! THANK YOU: I had a lot of great friends do a lot of hard work. 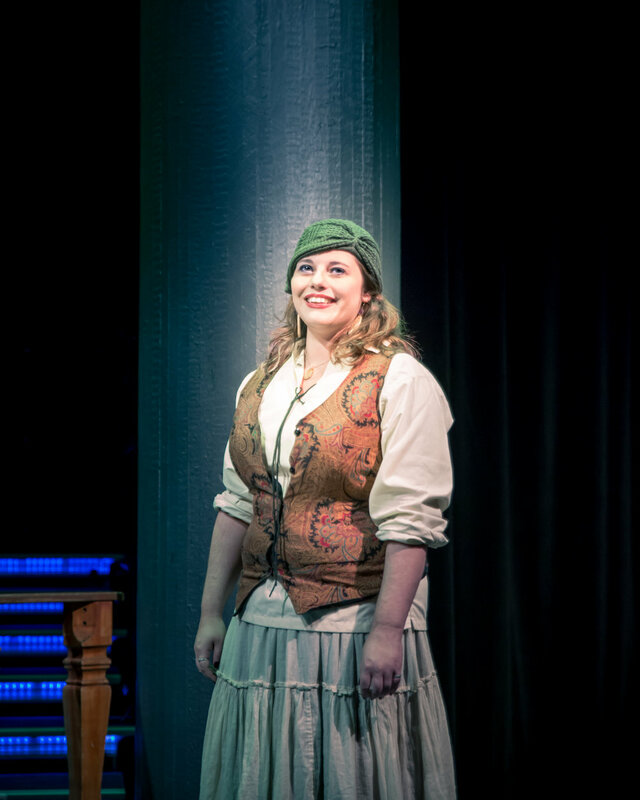 Wonderful Karla worked tirelessly to get us some major press coverage. My dear friend Adrienne taught a donation-based yoga class and raised $800! My friends Kassi, Laura and Nathan each had small private fundraising parties. They put a lot of time and energy into those parties and raised a lot of money! My good friend Darbiene asked all of her friends to donate in lieu of birthday gifts. She was an avid supporter - always checking in to see how "we" were doing -- and making homemade thank-you ornaments for her friends who donated! Just amazing. My friends Sarah, Kaha, Melissa, Nora, Paul and Amy all blasted their social media and contact lists. 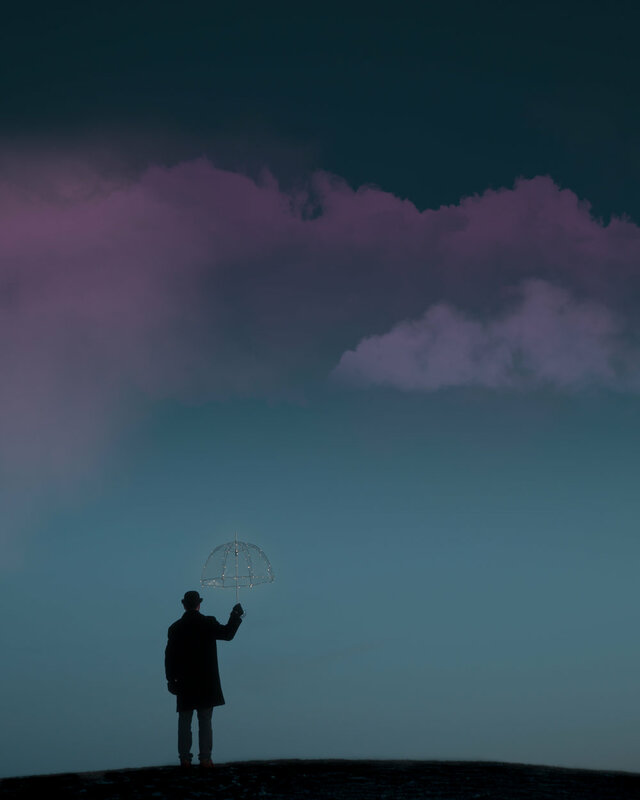 Tracy shared a photo a day for 12 days teaching others about the project. My friend Laura connected me with a fundraiser night at a local store - and her husband Brad and his company Tradition acted as a main sponsor. Also - a special thank you to the good folks at American Refugee Committee. My project added hours of work for Jenna, Beth, Chris and Jon. They were so encouraging and wonderful to work with. And thank you to Kevin Kuster and Watts of Love for supporting this project and giving us access to their solar powered headlamps! So many blessings have come from this project. I've been able to witness the selfless, good-hearted intentions of so many wonderful people in my community. It was a joy to see my friends be supported by their friends. It really is a testament to their characters and our community! So much positive energy and good will! There was also a large amount of donations that came from people around the world who learned about the project through social media channels and Kare 11 news coverage. I would like to say thank you to all who contributed! You are also a large part of this! I hope to someday share some follow up stories about the lights being put into action in Uganda! I know there is ARC staff gearing up to travel there soon with several boxes of lights! As far as the Shine On Project goes... it is closed for now. I am going to take some time to think about what to do next! Keep it going?! Start something new!?! It has been so much fun! Thank you so much for supporting my project & helping refugees in Uganda. Thank you for showing me how powerful we can be & the impact we can make when we all come together! Galleria Edina asked me to take a few photos and share what I think makes Galleria Edina a unique destination for holiday shopping. I always think of Galleria as the place to find a little bit of Europe right here in Minnesota! I am inspired by the wide range of uncommon items you can't find anywhere else in Minnesota. Backpack purse by Louis Vuitton, leggings by LuLuLemon and wedge boots by Sorel found at Trail Mark. Galleria really shines during the holidays! I just love this "uncommon find" from Trail Mark in Galleria. These boots have become my go-to shoes for the winter. Weatherproof wedge boots. Super comfortable & in my favorite buffalo plaid! The great black and white graphic wall was a temporary installation in their new expansion area. A big thank you to Refined Custom Homes for including me in their Faces of Pamela Park series! I am excited to announce The Shine On Project! The goal of this project is to send as many solar powered lights as possible to the Nakivale Refugee Settlement in Uganda. I visited this area over the summer with the American Refugee Committee (ARC). Read about my travels here. Well - when I got back I was motivated -- but also very busy. The summer flew by and suddenly it was September, school was starting and I hadn't planned my art show! 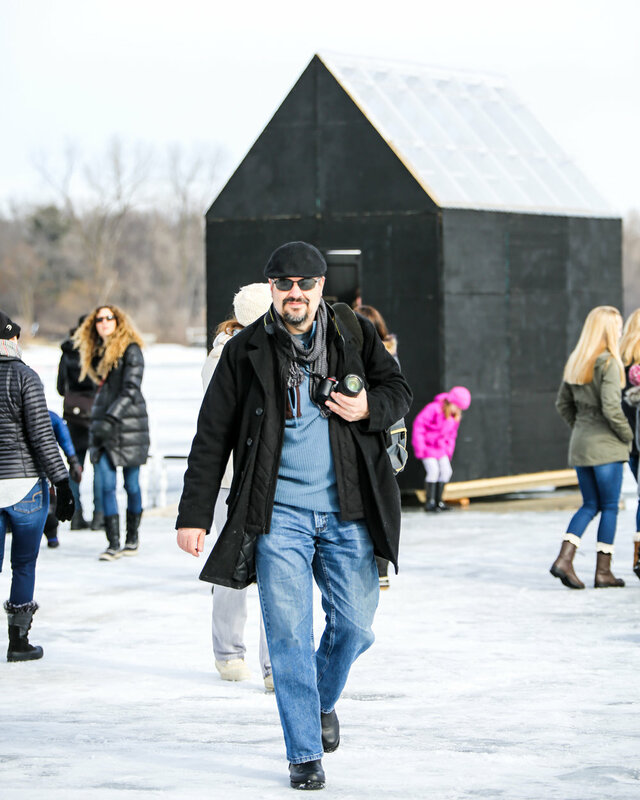 At that same time the program I direct, Art of Edina, was starting back up for the season. (It usually takes a little nap over the summer.) I was in talks with a large local mall named Southdale Center to create a new installation. Every few months we install community art in their main atrium. One day I had an idea. 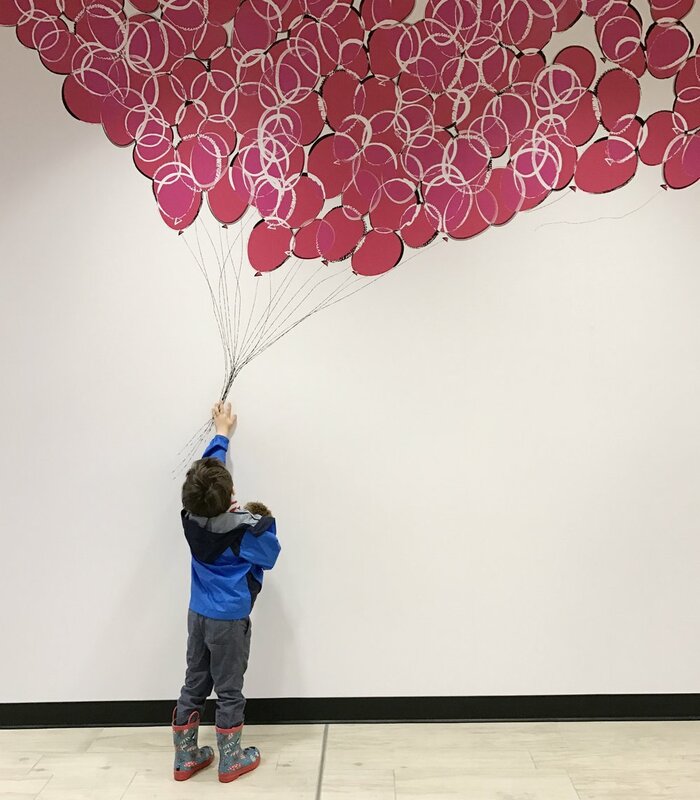 Why not do a two-part Art of Edina Installation at Southdale Center that focuses on the joy and beauty we had seen with ARC in Uganda... I was so pleasantly surprised when Southdale responded with encouragement to my idea! What if we could bring the Watts of Love solar lights to the refugees in Uganda? We learned that these solar powered lights could make a really big difference. Safety from fires and burns caused by kerosene, the ability to learn and work in the dark, the freedom of being able to walk at night -- and the potential to save money that would've been designated towards fuel..
ARC has an office in the refugee settlement. They contacted a refugee on their staff there and the idea was met with excitement and encouragement. They could definitely put those lights to good use! We had a plan! Part One of the installation would be the art show I had dreamed of! 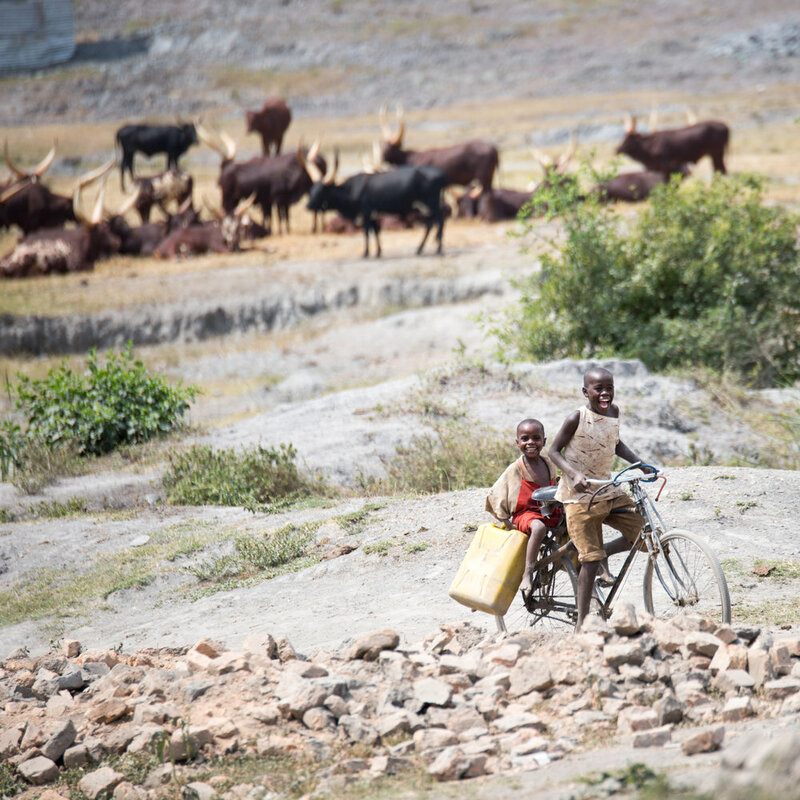 We would make large prints (some three feet high) of our photos from our travels to Uganda. 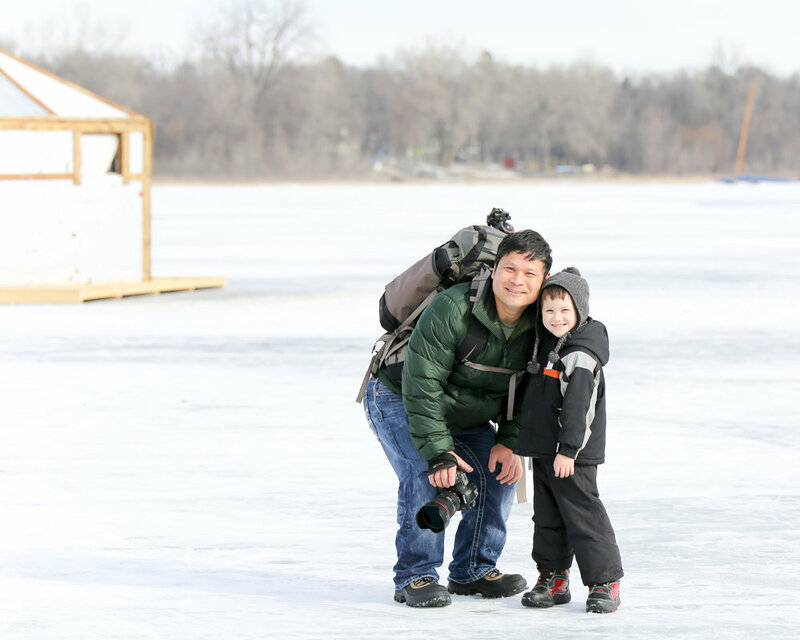 I traveled with the American Refugee Committee and a handful of talented Minnesotans. You can read about them here. In September I reached out to my fellow travelers and collected their beautiful photos. At the beginning of October the photos were installed in the main atrium at Southdale! Part Two of the installation is in process! The entire 4th and 5th grade classes at Our Lady of Grace Catholic School (OLG) in Edina are making colorful paper lanterns to decorate the main Southdale Center atrium. We hope to leave the photos up and have the lanterns hang in the center. Amy Sack is the art teacher at OLG an is overseeing the art project. I had a sneak peek and the lanterns are beautiful! We will have about 150 lanterns installed in the middle of November. 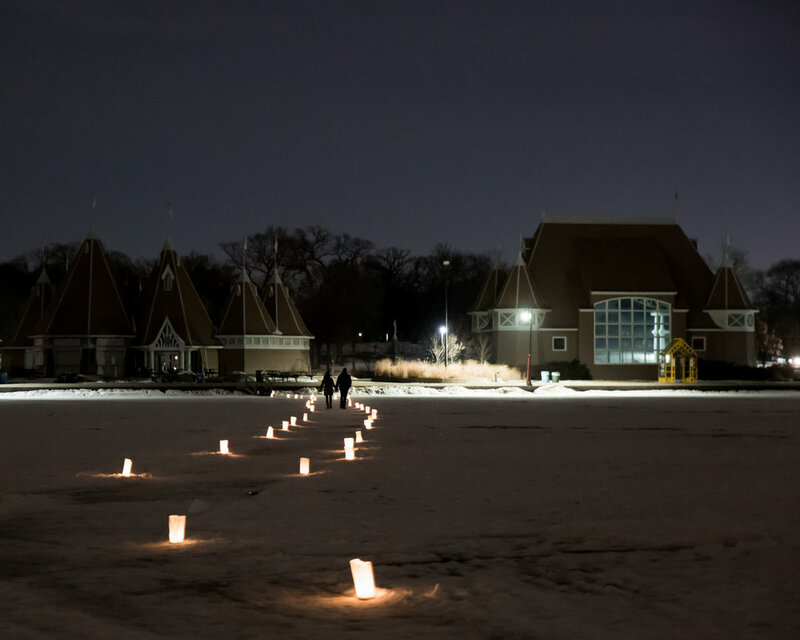 Here's the best part: My friends at Tradition Companies - the guys who sponsor Art of Edina - have agreed to buy one Watts of Love headlamp in honor of each OLG child that created a lantern!! The headlamps will be sent in the care of American Refugee Committee to the refugee settlement in Uganda! That means we already have over 150 solar powered headlamps going to Uganda! And that is just the start.... One day at lunch with my friend Karla Hult - we discussed the idea of "going bigger." What if we asked the parents of the OLG students, friends, colleagues and - anyone else willing to listen - to buy a headlamp too? With Karla's encouragement - The Shine On Project was born!! I am committing myself to working hard and strategically to see just how many lights we can send! I have recruited a group of friends to help me grow - to act as ambassadors and also encourage others to buy a light. I have an idea for a fun run, maybe an art sale.. I plan to do all I can! If you are reading this & you've gotten this far -- please consider buying a light too! Had a great night at the Curated Fashion event at the Mall of America last night! Hello, I wanted to share with you an update on my work with the iPhone Photography school. In April 2016 I was asked by the iPhonePhotography School to become one of their three long-term "Master Teachers." It means that every three months, I produce 6 short instructional videos for their students. I also spend several hours that month consulting students on their photography, critiquing photos and answering questions. 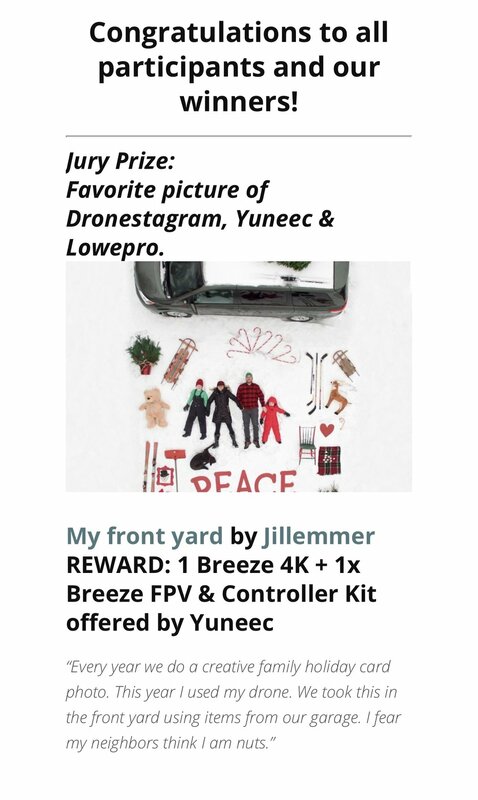 I also select the top 50 photos to be featured. It is an honor to work as an employee with the iPhonePhootgraphy School. I have worked with them for over a year now and they have always been very professional, organized and committed. I personally enjoy making these videos because I end up learning a lot myself! I also love all of the people I meet. There's so much energy and excitement! Recently, they released one of my Master Class videos! Watch for free while you can by clicking here! They interviewed me! Before I started writing for them, they took the time to do a profile about my work. The iPhonePhotography School held a conference on June 6th, 2015. I spoke (live) during this event. I gave a 45 minute talk about editing and then took questions afterwards for an hour. You can click here to read more about it.